Main Contractor / Principal Contractor for a new build boat house. Sustainable, environmental and all ecological impacts taken into account on this environmentally friendly new build. 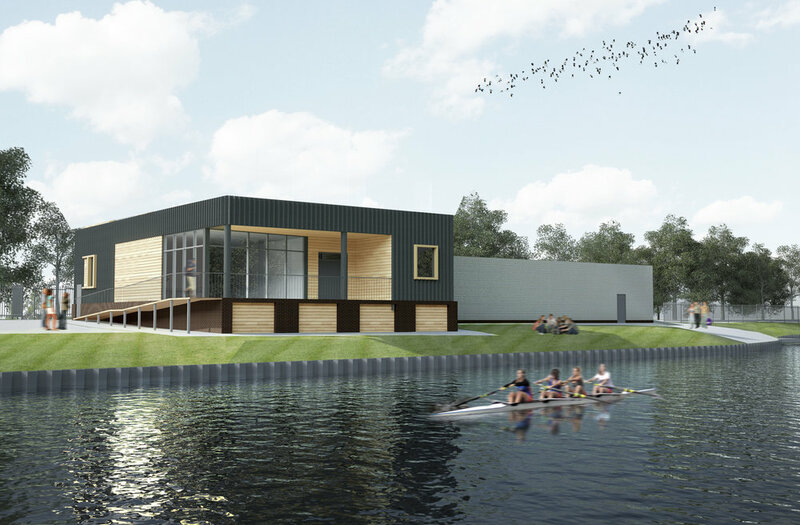 Our brief was to construction a new build boat house and rowing club facility incorporating a boat storage area for up to 50 boats and adjoining dry side support facility with kitchen, changing areas, showers, w.c. and circulation areas. The external areas included a car park, raised decking with access ramp and hardstanding, extending to a floating pontoon. The Boat House was built alongside the Aire and Calder Navigation Canal and is in close proximity to the River Aire. The probability of flooding was a major concern with a requirement to contain on site water run off. A below ground storage facility was installed, which allowed for the subsequent staggered release of the water into the canal. We worked closely with the Canal and River Trust to ensure our works met all their strict criteria with regard to the environmental and all ecological impacts. The Boat House was built as the result of a partnership between the University of Leeds, Leeds Rowing Club, British Rowing and Leeds University Union. It was funded by the University, British Rowing, Sport England and WREN, which awards grants for community projects. Due to funding restrictions placed on the project, strict timescales and deadlines where imposed. The Boat House is now home to Leeds University Boat Club and Leeds Rowing Club.